This one isn't new. In fact, next year it will be ten years old. However, it is new to me. One of my favourite types of mystery/thriller books to read is forensic medical thrillers penned by people who have previous or current careers in the field about which they base their books. Kathy Reichs Bones series and Tess Gerritsen's Rizzoli & Isles series (both of which now have successful television series based upon them) are in this sub-genre of books. 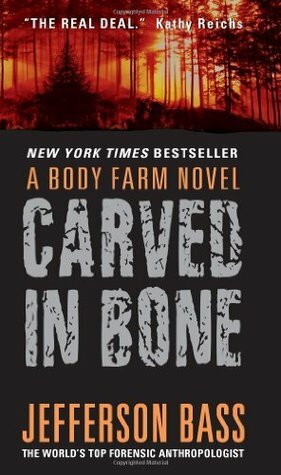 Another series in this sub-genre that I have recently discovered is the Body Farm series. Dr. William M. Bass is the forensic anthropologist who founded the now well known "Body Farm" aka the University of Tennessee Anthropological Research Facility, part of the University of Tennessee Medical Center. Founded in 1981, the facility is a place for the study of decomposition of human remains. Cadavers donated to the research facility are placed in different settings throughout the 2.5-acre wooded plot in order to study they effect of decomposition under various conditions. Until the early 2000s, Tennessee was home to the only "Body Farm" in the country. Now there are five such research facilities in the United States, and other countries are beginning to take steps to open similar sites in Europe, Asia, and Australia. The University of Tennessee Anthropological Research Facility first gained notice in popular culture with Patricia Cornwell's 1994 novel The Body Farm which had a central protagonist based upon Dr. William M. Bass. In 2006, Dr. Bass collaborated with author Jon Jefferson to begin publishing a series of murder mystery novels influenced by real cases studied at the facility in Tennessee. The books are published under the pseudonym Jefferson Bass, an amalgamation of both authors' names. The "Body Farm" as it is colloquially know, is a subject that has always been of great interest to me, and I'm not quite sure how I've gone nearly 10 years not knowing that its founder has a mystery/thriller series spanning nine books regarding goings-on at said facility. I have a lot of catching up to do. Carved in Bone, the first novel in the Body Farm series is available at the Ocean City Free Public Library.